1952 Black Mountain College, North Carolina. studied pharmacology at the University of Texas, Austin before being drafted into the U.S. Navy Reserve in 1942. Robert Rauschenberg was an American artist who came to prominence in the 1950’s transition from Abstract Expressionism to Pop Art. Rauschenberg is well-known for his "Combines" of the 1950s, in which non-traditional materials and objects were employed in innovative combinations. Rauschenberg was both a painter and a sculptor and the Combines are a combination of both, but he also worked with photography, printmaking, papermaking, and performance. He was awarded the National Medal of Arts in 1993. Rauschenberg’s works in the late 1940s, such as blueprints, monochrome paintings already reflected the artist’s life-long ambition to bridge the gap between art and life. For example, his White Painting, 1952 was literally a white blank canvas whose surface were constantly changing according to varying light conditions and the shadows of people in the room. This idea of ‘emptying-out’ of any kind of arbitrary forms and colours inspired John Cage’s silence’ composition 4’33’’, 1952 in which the silence played the role of ‘aural blank canvas’ to reflect the changes in surrounding environments. Artistic interaction between Rauschenberg and the visionary artists Merce Cunningham and John Cage whom he met at the Black Mountain College, played a crucial role to develop the artist’s idea of non-hierarchical art and emphasis on the chance, varieties and process in aesthetic creation. 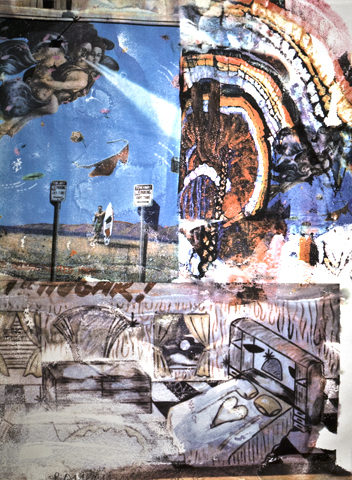 Upon his return to New York in 1953, Rauschenberg began to create works integrating sculptures with painting for which the artist coined the term ‘Combines.’ As a ‘sculptural collage’, Combines integrated aspects of painting and sculpture and include materials traditionally outside of the realm of fine art such as stuffed animals, quilts and pillows. From the mid 1960s through the 1970s, Rauschenberg developed his signature procedure of building visual fields by juxtaposing diverse silk-screened images from everyday life. 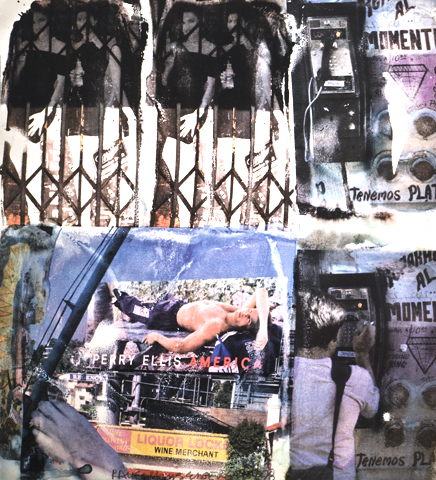 During the 1980s and 1990s, he continued the experimentation in printing images onto various surfaces like aluminum, Plexiglas disks and clothes. Throughout his entire career to date, Rauschenberg initiated numerous projects to promote collaborations between artists in different culture and those between artists and engineers. He also actively participated in other genres of art such as performance, choreography and theatre set design. In 1998, the largest retrospective of Rauschenberg’s work to date was held at Solomon R. Guggenheim Museum, New York.